FILE - Zimbabwe President Robert Mugabe attends the launch of basic commodities in Harare, Zimbabwe. For nearly a century, the life of Robert Mugabe has been closely, almost inseparably intertwined with the Southern African nation he ruled, Zimbabwe. Mugabe was born on February 21, 1924 in what was then the British colony of Southern Rhodesia. Raised by his mother after his father disappeared, Mugabe was educated at a local Jesuit mission, later becoming a teacher himself while at the same time, earning degrees in history, English and economics. Moving to Ghana in the mid-1950s, Mugabe became highly impressed by that government's drive to provide education and opportunity to the lower-class. He declared himself a Marxist and returned to Southern Rhodesia for what was supposed to be a short stay. But Mugabe became outraged and disgusted by the white minority British rule and oppression of majority blacks. Despite constant threats by police, he recruited other young militants who were also fed up and demanded changes in the country's constitution. Mugabe founded the Zimbabwe African National Union, was arrested and while imprisoned, began directing a guerilla movement against white rule. The fighting lasted throughout the 1970s when the British and Rhodesian Prime Minister Ian Smith, realizing there could be no negotiated settlement, granted Southern Rhodesia its independence in 1980. The new name of the country became Zimbabwe and Mugabe became prime minister. He was elected president in 1987 after forming a unity government with the rival ZAPU party. Conditions in Zimbabwe started deteriorating in the mid-1990s after a period of economic growth that saw new schools and hospitals for the black majority. Mugabe became less and less interested in sharing power. Inflation began to soar and government workers frequently went on strike. Mugabe made world headlines in 2000 when his supporters started seizing white-owned farmland without compensation and redistributing it to impoverished blacks. He said Britain refused to cooperate with his request to pay restitution to blacks who lost property while under colonial rule. Meanwhile, Zimbabwe's economy collapsed due to crop losses, AIDS, political instability and hyperinflation. But Mugabe refused to give up power even after losing the 2008 presidential election. His rival, Morgan Tsvangirai, eventually gave up campaigning for a runoff after deadly post-election violence. Mugabe was re-elected in 2013 in a vote widely suspected of being rife with fraud. 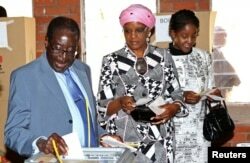 FILE - Zimbabwe's President Robert Mugabe casts his vote as his wife Grace and daughter Bona (L-R) look on in Highfields outside Harare, July 31, 2013. At age 93, he was looking forward to yet another election next year. He took to his Twitter account late Tuesday saying: "Thanks for your concerns, there is NO coup happening in Zimbabwe. Please continue with your lives and face up to your own problems."